With Pinterest being all the rage now and more and more businesses flocking to it, it’s only fitting to add a Pinterest App to your Business page on Facebook. Make sure you are logged in as your personal profile in order to do this. 1. In the search box start typing in Pinterest and you should get an option for Pinterest Page App, Click on that. 2. Next screen is asking you to select the Facebook Page you would like to add your Pinterest boards to then click on Add Page Tab. Click on Save Settings and you’re done! Now lets see how it look on your page. 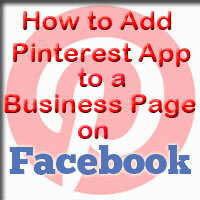 Head on over to your Business page and you should see the Pinterest App Logo below your Cover photo. Click on it to see the boards you chose. Have any questions? Let me know in the comments below and as always I’m here to help you in anyway I can. Do you know if you have the new Business page layout? The apps are no longer underneath the cover photo, they show up along the left side of your page. If it’s not there under Apps let me know the exact steps you took and I’ll help you try to figure this out.